I read “Jupiter Meets Uranus” in one sitting. Anne Whitaker’s writing style is so engaging, her research so fascinating that a lot of the time the book reads more like a novel; a page turner of the astrology world. I have to say that I’ve never been hugely interested in mundane astrology – much like I have never been one to watch the news or engage in any kind of political thought whatesoever. At school I loathed the history of the industrial revolution and the interminable time spent on ‘Peat Bog Man’. What we learned seemed out of context and I felt no relation to it. Perhaps it is my Aquarian Moon and my overwhelming 9th house that pushes me relentlessly to look to the future. So it was with these thoughts in mind when scanning the content of the book that I felt I would probably find the personal experiences of the the author’s research subjects more interesting than the collective experience. I was wrong. Both were engaging in their own ways. Anne Whitaker achieved for me what my poor history teachers at school never managed: to show history in context of its cycles and give me a sense of meaning and belonging to the great over-arching stories that manifest over sometimes centuries in our collective experience. Where before there had only been boring facts and figures, now there were archetypal stories being played out on a grand scale, synchronicities beyond explanation. The book covers the history, myths and legends behind each planet giving the reader a wonderfully full picture of the energy of each. She then moves into generally exploring the cycles of the collective planets before turning to a more concentrated overview of the Jupiter-Uranus conjunctions. A meticulously researched section on the mundane happenings of when Jupiter and Uranus touched on the ‘hotspot’ in Aquarius that the author had identified kept me completely enthralled and also reminded me of long gone headlines that had managed to stick in my mind. For example – whatever did happen to the Raelians and their supposed cloned children? The connections that Anne found during her time of research were fascinating and sometimes staggering almost beyond belief yet there in black and white. It certainly stimulated the desire in me to look more closely at mundane astrology. The often sparsely edited answers from Anne’s research subjects found me strangely touched. Here they laid out their lives in their own words, from death and disaster to love and goals achieved. From heartache to heart’s desire I felt moved by many of the insights and feelings expressed. One in particular who described much of his experiences through dreams captured my attention. I think I felt moved perhaps because it is not often we stop to think about our own lives and look through a long-view lens. Reading the unfolding stories of those who had responded to the author’s questionnaires over a period of time made me think a lot about my own story, the over arc that bridges what can seem like a time of devastation to a time of completeness. It is easy to forget, lost in the details of daily life, that there is a bigger story happening. After a close look at the effects of Jupiter conjunct Uranus during 1997, the author then moves on the explore this in connection with the greater cycle of Neptune as the mysterious planet activated the hotspot point between 1999 – 2002. 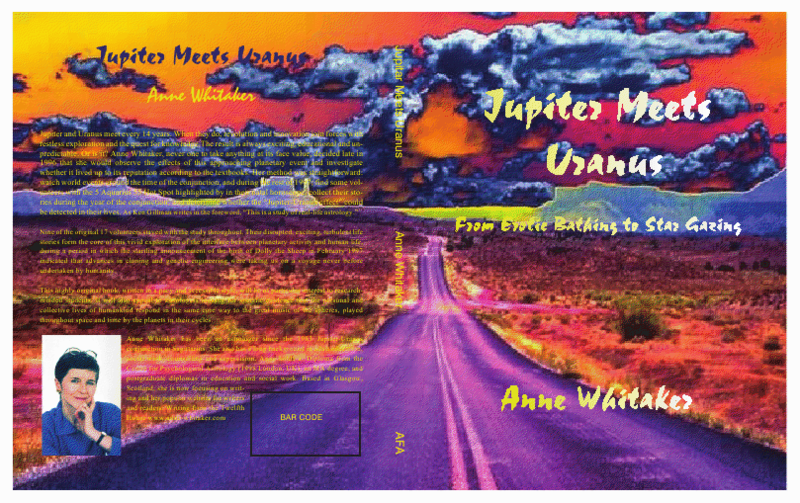 Reading Jupiter Meets Uranus has left me with many tantalising questions. The author doesn’t spoon-feed the reader. She presents the charts of her subjects and their words and leaves it up to us to look further into it. Woven into her writing are quotes ranging from Shakespeare to Milton and some excellent recommendations for further reading. Certainly this book has given me a thirst for research and shown how much potential there is for further research into planetary configurations and cycles. Anne Whitaker is a talented writer who stimulates the imagination of the reader whilst given them a wealth of information. You will be astonished by synchronicity and amazed at the astrological connections between for example Dolly the Sheep and Mary Shelley or the discovery of America and the Moon landing. I look forward to reading more from her in the future.